Waterfowl hunting, Spring Turkey hunting, surf fishing. I have both, they're easy to throw. 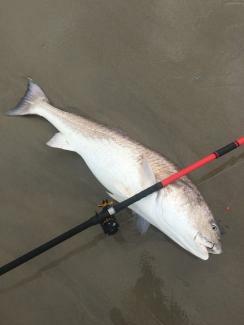 The 1305 is my go-to beach rod for 6-8oz+bait. It has a little softer tip, and fights fish a little better. Having said that, if you want to really put the heat on a drum, the 1306 is the way to go. It excels more at the 8-10+bait range, doesn't really load well with 6oz. I use mine off the beach also, and it makes an excellent pier rod. If you're a bigger guy and throw hard, you might want to get the 1306. I feel like I can really get on mine with 8-bait, whereas with my 1305 I have to slow down and let the rod load more. Hope this helps. The rod in my avatar is my 1305. April 9th is opening day in Boston. Watched Sale pitch in Fort Myers on the 23rd and he looked awesome, guess he left his game in FL when they flew to the left coast. Not overly concerned as they never play well out west, but we do need to win 4-5 really quick here. Three more in Oakland, then Arizona, then home for Toronto next week. Pedroia should be in the lineup on the 9th. Saw him at the Fort as well, and he looked healthy. Not sure what's going on in MLB right now; Sox, Yanks, and Astros are all off to terrible starts. Backside of Wiggins Pass has nice structure and should be good on incoming to high tide. Caught snook there last week and saw a couple nice redfish. Easy walk from the last parking lot at Barefoot Beach. 2.5" Yo-Zuri swimmer, pearl flash color. Don't know the exact color code, but they really liked that little plug last week. Works well in clear and stained water. Fished Sun-Weds. Very slow, water seemed to be cool. Had a couple throwback snook around some mangroves, but that was pretty much it. Didn't see any other fisherman doing much better than that. Lots of algae in the back as well, never seen that before. Did see a nice 30-32" snook on the beach that wouldn't even eat a live shrimp ...I cussed a bunch at that one. Still a fun trip, very busy this time of year, will be going back towards the end of May next year when it calms down. Beach Snook are a good option, they seem to like low-light better in my limited experience. Also you can try the canals and Estero Bay around the mangroves for more snook, speckled trout, and probably redfish. Renting a kayak for a few hours can open up a myriad of spots for you. Will be in Bonita Springs on Friday for a week, shrimp bucket in tow, looking forward to some warm weather and fishing. Going to rent a kayak a couple days and explore Estero some more, plus fish the beaches early and late. WTB an 9'6 Medium surf rod. Does it have to be 9'6"? I have a custom Rodgeeks 9' 1-4oz I will sell for $150 shipped. Owners are shying away from huge deals just based on talent alone anymore ...which IMHO is the way it should be. Pete Rose said it best when all players signed one year contracts, every year. "We had to play!" These huge deals tie up too much money. Look at Boston and Sandoval, luckily this is the last year of that debacle. Yankees and Stanton ...strikeout king of the world. Orioles and Chris Davis; getting paid huge dollars to bat .186. Rays and Longoria ...the list goes on. Machado is a good ball player, there is no debating that. I think he's a punk and borders on dirty and am glad he's on the left coast, but this whole thing has just opened up the door for more of the same in the coming years. Bryce Harper will get a comparable or bigger deal now, and he's another prima-donna that doesn't hustle and batted less than .250 last season. I love baseball, it's our game. I'd like to see contract caps on service years and offers based on performance and not perceived talent alone. The game would be more exciting. Ever go to AA or AAA ball games? Those guys play! They have a goal to get to the next level, and they have to show up and work every day. Machado is guaranteed 300 million over the next 10 years, so other than winning the World Series, what is his ultimate goal? What is he going to play hard for? The Padres won't be a playoff team anytime soon, which again, in my opinion, means Manny is after money and doesn't really care about the game. I'd quit my job yesterday if a team offered to pay me my 5-figure salary to play ball everyday. Anyway, rant over. Boston is in good shape, Pedroia is healthy(for now anyway) ...should be another fun year in Beantown. Go Sox! No problem, it's a cool place, you'll love it! Visited a little north(Papagayo) of you in 2017, didnt bring a rod, but could have caught Albies off the beach every morning if I had had any kind of metal. Also saw schools of snook right in the wash while swimming. I did fish a 1/2 day charter one morning and we had a good haul of red snappers within a mile of the beach. We will visit again one day and I'm definitely bringing my own surf tackle when we do. Watch the weather and water temps, they can and will flucuate that time of year. If the water stays in the 60-65 degree range, you'll have blowtoads, bluefish, seamullet, spot, and Drum.